Just three days left before our Online Bake Sale goes live! After a week of promoting and calling out for donations, we now have a total of 48 items for auction donated by 38 bakers/bloggers from 5 countries. (A MILLION THANKS to all our awesome bakers/bloggers for their generosity!) Most items are only available for shipping within the US, but we have 4 items available for international shipping, 2 within Europe and 1 in the UK. So, PLEASE HELP US in spreading the word! Invite your family and friends to bid on Monday(Nov. 25)! Auction will open 8:00 a.m. CST and will be live for 24 hrs. Bidding will be easy! There'll be a bid form ready for you to fill out! Can't wait to see how our Online Bake Sale will turn out! Hopefully buyers will bid generously to help us reach our goal of $2,500 for Sagip Kapamilya! Andrew Sigal, the founder/chairman of FoodPool, a California corporation headquartered in Oakland, CA will match the first $500 raised in our bake sale! Thanks so much FoodPool! Plus we have cash donation pledges from Corinne of Heart of Mary, Kate of Diethood, Sawsan of Chef in Disguise and Loreena Yeo of 3:16 Team Realty totaling to $250. With all that, it means we are $750 closer to our target! I'm really ecstatic! I'm sure that with your help, we can reach our goal! TOGETHER, we can make a difference for Typhoon Haiyan victims in the Philippines! 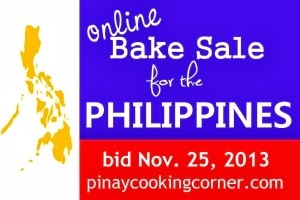 visit ONLINE BAKE SALE FOR THE PHILIPPINES.